For a complete list of stallions nominated in the Color BCF, click here. The National Snaffle Bit Association is proud to announce the creation of the Color Breeders Championship Futurity which is held in conjunction with the NSBA World Championship Show and Breeders Championship Futurity beginning in 2018. To be eligible to participate in the Color BCF program, a horse must be sired by a stallion who is nominated to the Color BCF during its foaling year. If eligible, horses may be enrolled at any time beginning as weanlings through their three year old year (4 to 6 year old may be enrolled until December 31, 2018). Weanlings enrollments begin at a one time payment of $125 and increase with the age of the horse. The Color BCF also offers a sliding scale of multiple foal enrollments. The purse is funded by stallion nominations and foal enrollment fees collected each year. The stallion nominator receives 20%, the foal nominator receives 10% and the foal owner receives 70% of foal earnings. In the even the foal ownership changes, the original nominator will receive the 10% earnings. 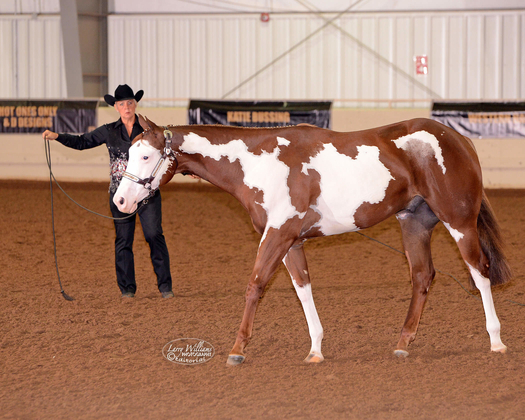 Color futurity classes will include Longe Line, Western Pleasure, Hunter Under Saddle, Open and Non-Pro. As the program matures, a Limited division along with Trail and Western Riding classes will be included. An exhibitor may show as many horses in as many classes as they are eligible for each division - NSBA Membership is required for all owners and exhibitors. Stallions may be nominated in to the Color Breeders Championship Futurity as well as the Breeders Championship Futurity. Foals may be enrolled in to one or both programs, providing the sire is nominated in the corresponding program. Once the enrollment form has bee received and validated and a copy of the breed registration papers have been forwarded to the NSBA office, a Certificate of Eligibility is mailed to the foal owner. The Certificate must be current when the horse is shown. Any changes in the information will need to be forwarded to the NSBA office, along with a transfer form and a copy of the horse's registration papers showing current ownership must accompany the transfer for. Change in the name of the horse.